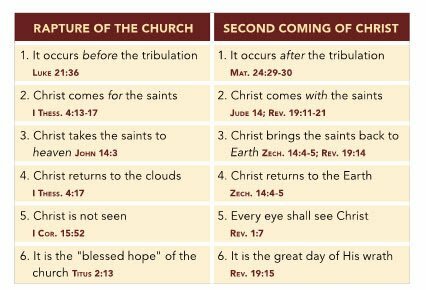 There are two detailed descriptions of the Lord’s return in the New Testament. One is written by the Apostle Paul (1 Thess. 4:13-18) and the other by the Apostle John (Rev. 19:11-14). Some people think the Rapture (1 Thess. 4:13-18) and the Second Coming (Rev. 19:11-14) are speaking about the same event which occurs at the end of the Tribulation. Did you notice the above chart? If you look carefully you’ll see that these two events are as different as night and day. It’s simply not possible that these two descriptions are about the same event! They have absolutely nothing in common. In fact, they are totally incompatible. That’s because they describe two different events separated by 7 years. The Rapture happens without the world knowing it, just before the start of the Tribulation. On the other hand, Christ’s Second Coming will be seen by the whole world at the end of the 7-Year Tribulation. I do not agree with a pretrib rapture of the saints. I believe in a resurrection of the saints at the second coming. Why? Because the rapture theory originated in the eighteenth century and made popular by John Nelson Darby. Darby planted the seeds and C.I. Scofield watered the seeds. Why would we believers think we are more special than those saints who proceeded us? 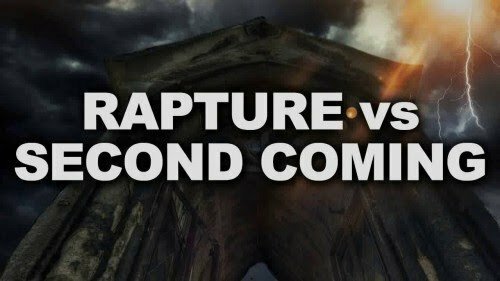 Dispensationalism goes hand and hand with the rapture theory. God showed grace to Noah and many others in the Old Testament. God’s character is unchanging and his treatment of mankind is the same through the ages. God had treated man from the beginning with mercy and judgement. I pray for all believers to be prepared in the event that there is no rapture only the resurrection. One of the great deceptions would be taking the mark thinking it would be okay since the rapture had not happened and that another mark would be the real mark of the beast.